Clergy from several Windsor faiths stand at the end of the multi faith service Tuesday. 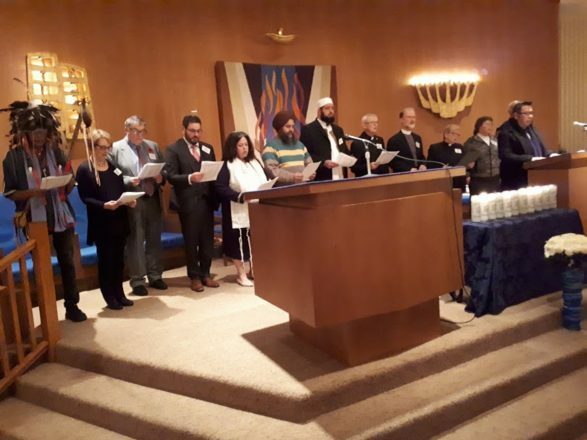 Hundreds gathered at Temple Beth El in Windsor the evening of Oct. 30 for a multifaith service to mourn the 11 victims of the mass shooting last weekend at Tree of Life synagogue in Pittsburgh. Windsor has a rich tradition of multifaith services, but this may have been the first in memory to bring religious leaders and congregants together to commiserate such a tragedy. Clergy from Christian, Muslim, Sikh and indigenous faiths talked, prayed and sang in the hour-and-a-half service, which opened by the lighting of yizkor candles in memory of the 11 Pittsburgh dead. The gathering underlined the goodwill that has long characterized the Windsor faith communities. 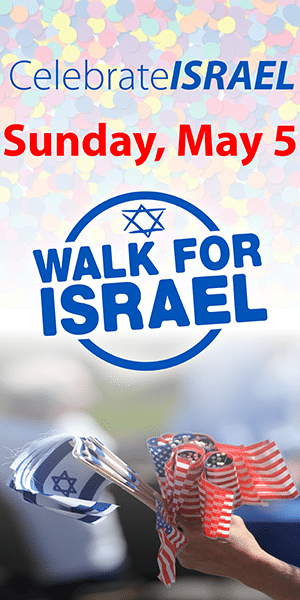 Bruce Elman, religious vice president of Congregation Shaar HaShomayim and the Windsor city hall’s integrity commissioner, called on the local community to respond to the atrocity by reaffirming Judaism and its larger community ties, noting the gathering was a first step. “We can stand together as a community united against hate,” he said. The Pittsburgh terror “began in the vile social media platforms that cater to anti-Semitic and other forms of hate speech,” Elman said. Imam Mohamed of the Windsor Islamic Association said the “attack on you is an attack on all of us” and that “we all under the skin are the same.” And he said violence afflicts all groups, pointing to the mass shooting at a mosque in Quebec City in January 2017 that killed six and injured 19. Windsor Police Chief Al Frederick told those assembled that synagogues and other religious institutions are there to support life “and most of all they should be safe places.” He reassured the community that it has the “unequivocal” support of law enforcement to keep those buildings safe.